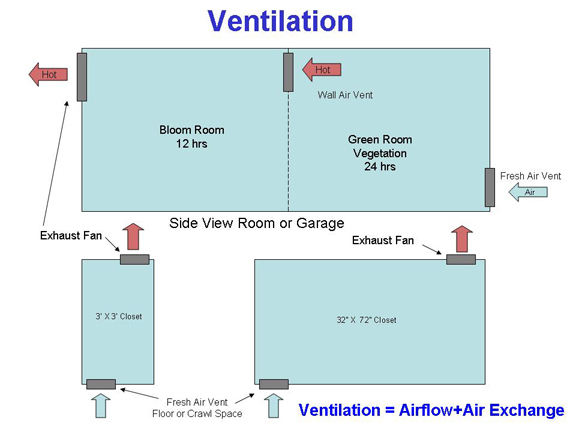 Ventilation is not the same as air movement. It is important to have fans in your grow to move the air and make the plant stronger. Fans alone however are not ventilation or air exchange. It is very important to have ventilation (air exchange). You must have fresh air coming into your room and you must exhaust the bad air that is created from humidity and the toxins the plant exhales. This is ventilation. Ventilation is very important and the key to success. Bring in fresh air from a low spot in the room and exhaust the hot air out at the high spot or top of the room. It is better to pull air out of your room than push it in. Put your fan in so that it is blowing air out of the room, not blowing air in. By sucking the air out of the room at a controlled location (the high spot) you are creating a vacuum. This will allow you to cut a vent in for fresh air at any location, preferably at a low spot. No fan is needed at the fresh air intake as the fan is exhausting air out at the other end. Get your fresh air from an attic, basement, crawl space or outside when possible.